The company that owns a pipeline which leaked 28,000 barrels of crude oil near a First Nations community in northwest Alberta is now facing environmental charges -- but some are questioning the timing of the province's action. The company that owns a pipeline that leaked 28,000 barrels of crude oil near a First Nations community in northwest Alberta — the largest spill in the province in 35 years — is now facing environmental charges. 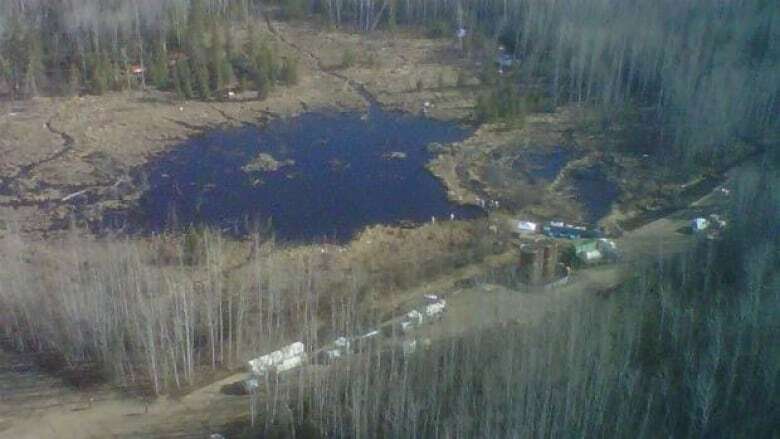 The April 2011 spill of almost 4.5 million litres of oil contaminated more than three hectares of beaver ponds and muskeg in a densely forested area. Lubicon Cree residents of Little Buffalo, 30 kilometres from the spill site northeast of Peace River, claimed fumes from the leaking crude made them sick with nausea, burning eyes and headaches. The community closed its school and ordered children to stay at home. But the Environment and Sustainable Resource Development board, which monitored the air quality during the cleanup, did not believe the symptoms were related to the spill. The Energy Resources Conservation Board later reprimanded the company saying it had inadequate leak detection and failed to test its emergency response plan. Alberta's premier at the time, Ed Stelmach, also criticized the oil company's poor communication with the First Nation, as well as with the province itself, following the spill. "From what I gather, they could be doing a better job," he said. "And we're going to hold their feet to the fire to make sure they're there and they will have to pay all the costs related to the cleanup," he said just days after the leak was discovered. But Garrett Tomlinson, the communications co-ordinator for the Lubicon First Nation, said he has seen little action in the two years since the accident. That is, until a Greenpeace report detailing the environmental impact of the spill was delivered to the Department of Energy on Thursday, he said. The report, which is scheduled for public release on April 28, calls the actions of both Plains Midstream and the ERCB into question, concluding that "the government and oil industry have consistently worked to limit reputational damage to companies rather than protect the environment." The document also highlights many of the same environmental issues that had been previously reported by the Lubicon First Nation, said Tomlinson, adding that many of the issues had also been noted in an ERCB report released earlier this spring. "The ERCB report came out almost a month ago, if i’m not mistaken, and there were no charges were filed after that," Tomlinson said. "And they would be the authorities on the subject." "[The Greenpeace report] seems to be really the only factor that led to the filing of charges, " said Tomlinson on Friday. But Nikki Booth, a spokeswoman for the ESRD, said the charges were laid as a result of the department’s two-year investigation into the spill, which the province has only now wrapped up. She said charges laid today are "in no way related to the Greenpeace report." "Our folks know that there is a two year statute of limitations and we take as much time as necessary when we’re doing an investigation like this so we can do our due diligence, ensure that we’re accurate and have all the correct information." Alberta Minister of Energy Ken Hughes has also weighed in on the Greenpeace report. "I reject Greenpeace’s contention that ERCB is biased toward industry," he said Friday. "The expectation from the government of Alberta has been and continues to be that the province’s regulator works on behalf of all Albertans to ensure responsible energy development and a clean and healthy environment." Tomlinson, however, is not convinced. "It wasn’t until Greenpeace came forward with their report that said the exact same thing that the ERCB [report] said, that said the exact same thing we’ve been saying all along — and threatened to release that report... only then did the province respond." "I think it’s just a testament to the fact that the Alberta government isn’t taking First Nations concerns seriously," he said. "We do have some concerns that it took two years to have these charges filed — despite the fact that we raised these concerns shortly after the spill and have continued to raise them to Alberta officials." Regardless of the motivation behind today’s charges, Tomlinson hopes the ESRD’s action will change how the province and its pipeline companies deal with First Nations input. "We really hope that the government takes the proper initiative to make sure we get a little more communication so we can keep our people safe." Tomlinson said members of Lubicon First Nation will be watching the situation very closely to make sure implementation measures are going forward safely. "It’s only a matter of time until we are dealing with damage like this again." Plains Midstream is charged with releasing a substance that damages the environment, failing to take reasonable measures to repair, remedy or confine the impact of the substance in an appropriate amount of time, and failing to clean up the substance to prevent further environmental impact. The maximum penalty for each violation is $500,000, but the court may consider a creative sentence that allows companies to fund environmental projects or research instead of paying a fine, said spokesperson Nikki Booth. The company declined comment saying it will review the charges with its lawyers and the Crown before responding. The 60-centimetre Rainbow pipeline runs 775 kilometres from Zama, Alta., to Edmonton and is capable of moving 220,000 barrels of crude oil per day. The company also made headlines in 2012 for an oil spill near Sundre, Alta. About half a million litres of light sour crude spilled into the Red Deer River with some of it washing into the Gleniffer reservoir, which provides thousands of Albertans with drinking water.